It’s Saturday and I can’t swim. Barry Feyder, who is also afflicted with a nerve problem and can’t swim, decided he should come to Manly and we would go for a walk. He arrived at 730am and after filling him up with a cup of tea we set off down the beach on a still, warm morning. We walked to Shelly and over the hill, before flopping back at Manly Wine bar for breakfast. Barry is the father of twin girls and I have raised three daughters so we have much in common and much to ponder. The challenges of modern child raising, what we did right, what we did wrong and the difficulties young women face in a more affluent society than we grew up in. We constantly ponder these questions and agree, that while we have “walked the walk,” and did our best, no one is an expert on raising daughters or what a “perfect” father should be. “The greatest gift a father can give his daughters is to love their mother,” was my piece of shared wisdom. Barry didn’t seem to disagree. By that measure he has been an exemplary parent. After the walk, it was still Saturday, so it was off to the gym, sore neck notwithstanding. The show must go on. 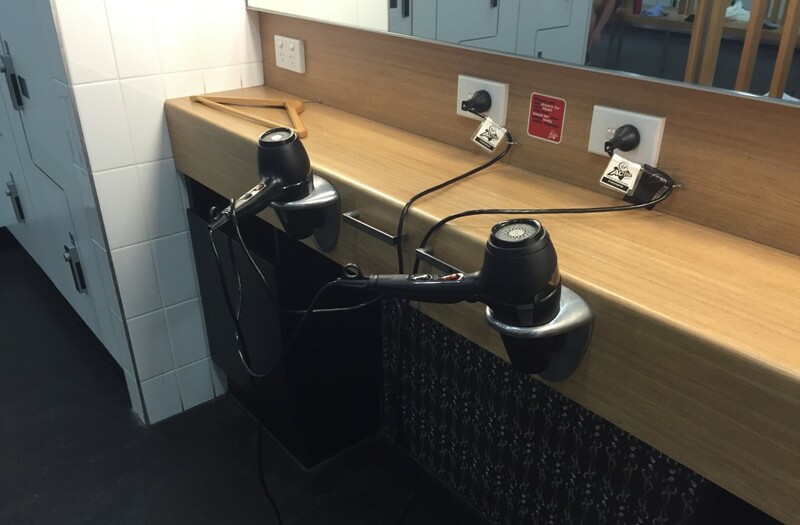 Not only is Virgin Active gym at Frenchs Forest noisy, but it also has hairdryers in the mens’ change room. Fair dinkum, it’s hairdryer dreamtime in these gyms. 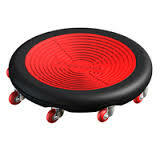 Maybe Sir Richard Branson needs them so if he drops in he can adjust his Pompadour. Maybe they are expecting The Donald who needs to tease his Beehive. Call me a dinosaur. I don’t care. Womens’ hairdryers should be n the womens’ change room. 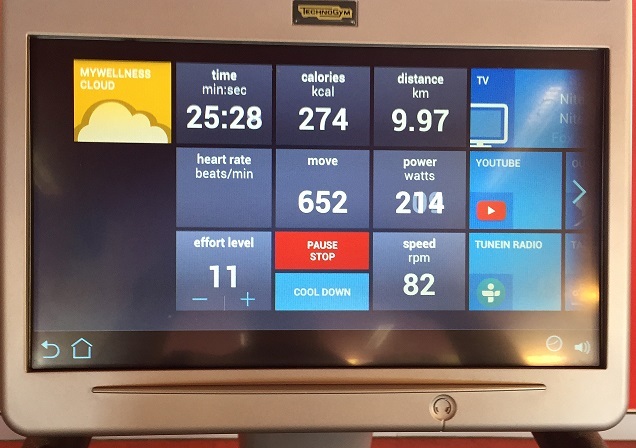 Anyway, big day on the stationary bike: 5 minutes on level 8 to warm up, 10 mins on level 9, then 10 mins on level 10. I cranked to 100rpm twice on level 10. Don’t believe me here is the proof. Then I noticed something. On one side of me was a guy about 40 and he was cranking around at level 8. The the guy on the other side, about the same age was on level 10. They both looked like hairdryer types. With five minutes to go I wondered what it would be like to go up to 11. So I punched the screen. Went to 11 and started to grind. Don’t believe me here it is. Cop that pomade boys – the Big Dog is in the gym. I manged to keep above 80rpm for the remainder of the session on a resistance of 11 and the bike only goes up to 15. I originally started all those months ago on resistance of 2. Can’t believe I’ve got to here. Cop this pomade boys – 82 rpm at a resistance of 11. An antidote to pain and I don’t have to rub it in my hair. Rest of the session was pretty standard although I’m finding it hard to get beyond 70kgs on the leg press machine. This stuff is therapeutic as I forget about my neck and the pain in my arm when I’m in the gym. The amazing thing is I’ve completely forgotten about having a broken leg. I guess that’s because I don’t have much pain there now and the pain in my arm is so much more intense that the brain focuses on it and gets anxious about it, particularly as it keeps me awake at night. The nervous system is a vast mystery, at least to me. with 20 CAT scan, x-ray and MRI images sitting on my dining room table. I’ll have a quick look before I go to work. I can’t resist this stuff. The images are like looking deep inside yourself. I often wonder if I will see my soul in an MRI image. I tore the envelope open and began to sort through the negatives. The x-rays were no surprise. 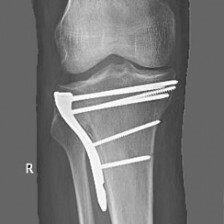 They showed a lot of deterioration caused by wear and tear over the years and advancing osteoarthritis. The 1998 fusion I had at C7/T1 was clear but, to my surprise, two other vertebrae at C4/5 had also fused of their own accord. I had been warned this might happen. Now I had five vertebrae in my neck instead of seven like other people. 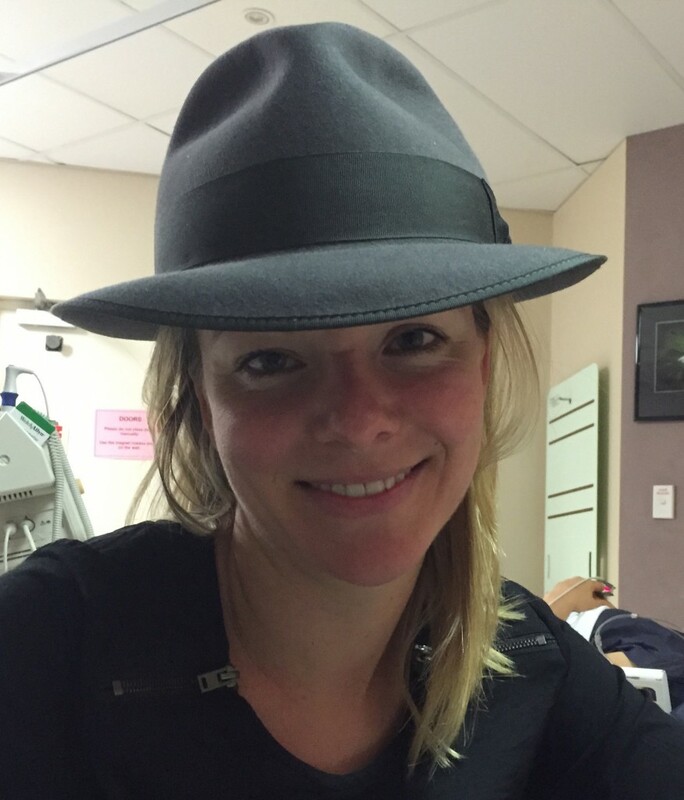 I gradually sifted through the CAT scan and MRI images holding each one to the light. On three levels of my cervical spine there was narrowing of the intervertebral discs as well as ossification of the posterior longitudinal ligament. The nerves running out of my spine were being crimped at numerous levels by degenerating discs and narrowing of the the neural foramen through which the nerves pass out of the spine. That explains why my arm and hand hurt. All of this I had expected and it is a pretty simple job with modern microsurgery to expand the foramen and relieve the pressure. I got to the second last negative and held it to the light. A a chill went through me. “I’m fucked,” I thought. I stared at the ghostly black and white image of my spinal cord running up through the vertebrae of the spinal canal into the base of my skull. I have looked at heaps of scans of the cervical spin and I can read them as well as any radiologist. You didn’t need any expertise to see what was going wrong with my spine, particularly the spinal canal. I felt numb. It was quiet in my apartment. Only the rush of the surf on Queenscliff beach rippled the silence. The timeless ocean, fragile humanity. I felt alone staring at those images. It was a lonely confrontation with mortality. I placed the scans in the envelope and tried to compose myself to face the working day. I tried to put it out of my head and treat it just like any other day, but as I walked to the ferry I knew it would be a long one. At 4 o’clock, with my envelope of images tucked under my arm, I was once again in Chatswood on a busy Friday afternoon. Dr Farey didn’t keep me waiting long which I appreciated. I walked with him to his room, knowing this was not going to end well and I wasn’t going to enjoy it. I handed him the large envelope and, as I had done this morning, he began to hold each of the images up to the light. He looked intently at each one, without commenting before laying each one down on his desk. I had been through this many times before. I knew if he took one of those images and clipped it up on the lightbox I was done. Slowly, methodically he worked through the pile. No images went up onto the lightboox. With three images to go, a ripple of hope arrived and I thought I might get out of there with no bad news. Then he looked at the second last scan. He spent quite a while holding it up to the light and looking at each of the images thereon without commenting. “Ummm,” he said finally. I saw that it was the same scan that I had looked at this morning. It was the scan of my cervical spine canal. He sat there looking at it for some time without further comment. We had both landed on the same scan. “Here it comes,” I thought. Finally he turned to me and very methodically piled all the scans into the envelope. “Well you have multilevel, degenerative disc disease and compression of the neural foramen on the left side of your spine at several levels. This is giving you the pain. This is fairly easy to fix, but you’ve got a much bigger problem,” he said. “No surprises. Here it comes,” I thought. He then described the problem in the canal of my cervical spine. The next bit was a shock – the solution. He described the process for surgical intervention. At first I just didn’t believe it. “Can someone survive after you do that to them,” I asked. “Sure, I do this operation all the time. It’s a well-established procedure but it’s major, major surgery.”. He drew on a plastic model of the cervical spine sitting on his desk, a detailed picture of the removal of the entire back half of the spine, from the base of my skull to the level of my shoulders. “What do you do with it, after you take it out, do you put it back?” The answer was no. This was not a finger or toe he was talking about. This was a spine. They don’t grow back. I still struggled to believe what I just heard. “You’ll be a quadriplegic,” Farey said matter-of-factly. We spent quite some time discussing all the options. 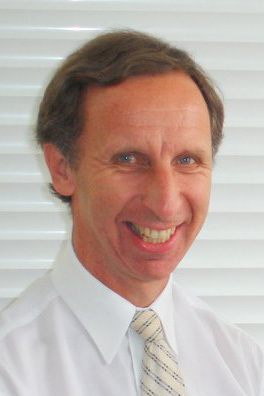 “You can do the small operation and relieve the pain but if you have the big operation I can do both at once. At some point in the next ten years you will have to have it done, or you’ll end up in a wheelchair. It may be wise to have it done now before symptoms develop. You’ve got some decisions to make.” We agreed to meet in three weeks. I was once more in the lift trying to digest bad news. This hasn’t been a happy place for me I. I emerged into the teeming hoard of Friday afternoon commuters thinking that by some strange time warp I had reappeared in Hong Kong. “Since when is it okay to spit in the street in Sydney?” I thought watching some of the passers-by. I hailed a cab and told the driver to head had to Manly as I wrestled with my emotions. “I hate Chatswood. It’s like a Chinese Beirut,” was my conclusion. “I guess this is another setback in my broken leg rehab,” I concluded. Gutbugs come home. All is forgiven. I need a challenge I can deal with. And so the day has finally arrived. My date with the cigar tube known as a Magnetic Resonance Imaging scanner. I didn’t sleep at all last night. I am not frightened of many things. Having to get on unruly horses when I was young, frightened me, especially when they rolled their eyes back so the whites became visible. That was pretty scary. Heli-skiing with its imminent threat of avalanche, is scary, especially as my good friend Johnnie Morgan was killed in an avalanche in New Zealand. Being buried alive in an avalanche would just be the worst possible death. And strangely, being stuffed head-first into the tight confines of an MRI machine, is right up there with them. I know this is irrational but there you go. I have to find out what is wrong with my arm and neck so I have to go in the tube. Not going to like it. I presented myself at North Shore private hospital at the appointed time of 9 AM. Filled in the mountains of paperwork and had a new box to tick “Do you have any metal implants or inserts anywhere in your body?” Yea! I ticked the yes box. Amelia turned up not long after, to keep me company. She said my palms were very sweaty – they sure were. I got the CAT scan and X-ray out of the way without incident, although I had an anxiety attack just sticking my head in the CAT scan machine. That’s pretty weird. Changed into the now regulation surgical gown and sat in a cubicle waiting. And waiting. And waiting. Plenty of time for all those little creatures that go slithering around in your brain trying to make you feel apprehensive. Astronomer, philosopher, poet and scientist and he’s a Muslim. They told me to try and think of something really pleasant, that would take my mind off the claustrophobia. The words of my favourite Muslim mate, Omar Khayyám, came to mind: Myself when young did eagerly frequent doctor and saint, and heard great argument about it and about: but evermore came out by the same door as in I went. 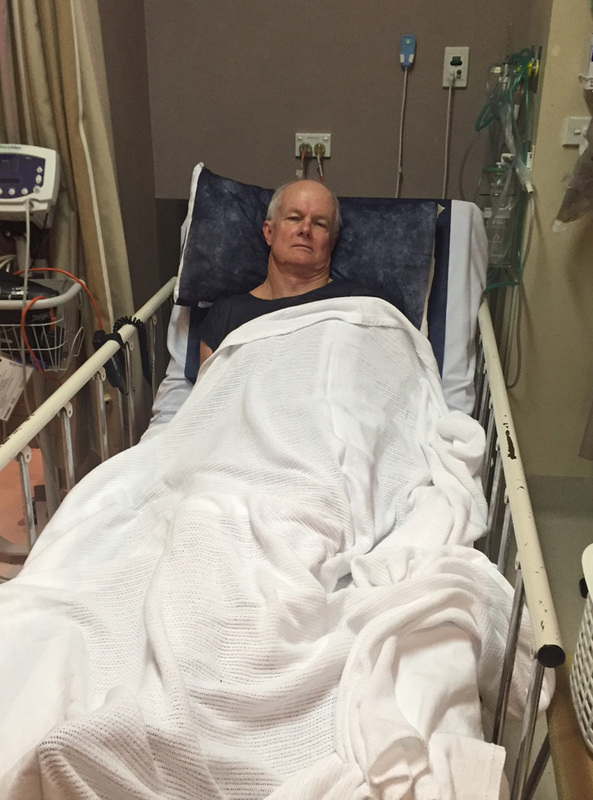 Here I am, 17 years down the track, in pain from a nerve problem and looking down the barrel of more spinal surgery. Going back in the same door I came out. Never mind, I get to spend some hours with my eldest daughter who thinks of nice things in our life, like sitting under a gum tree at our farm, Ullathorne. As old Omar would say, Be happy for this moment. This moment is your life. He was a clever old dude. If I could only have 10 people to dinner, he would be one of the first to get an invitation. John Lennon said, Life is what happens to you while you’re busy making other plans. I think he just pinched the idea from Omar who wrote it centuries ago and could probably play the bass guitar better than John Lennon. Hey, if nothing else it makes me forget my tibial plateau fracture. Contemplating the words of a bygone Islamic poet while waiting for sedation. Yes things could be worse! At least I’m not pregnant. Count your blessings son. The moment finally came. I lay down on a special gurney with my head in a kind of clamp. The nurse installed earplugs as MRIs create a terrific racket. She then jabbed a muscle relaxant into my arm. While doing so she kindly intoned, that this will help but it’s also an amnesiac, so you won’t remember anything. She put a cloth over my eyes so I couldn’t see as I was going into the tube and from that point on I remember nothing. What happened in the MRI machine is a mystery to me. I must have had the scan done because I was presented with a very large bill. I hope I had it done and wasn’t paying simply for the pleasure of wandering around in a hospital gown. I woke up and Amelia was standing at the end of my bed taking a photograph. At least I think she took a photograph because she showed me one later. She then drove me home, I think, but I don’t remember anything else. “Life is what happens to you while you’re busy making other plans.” And after a certain age you can’t remember most of it anyway. Well it just gets stranger every time I go to the gym. 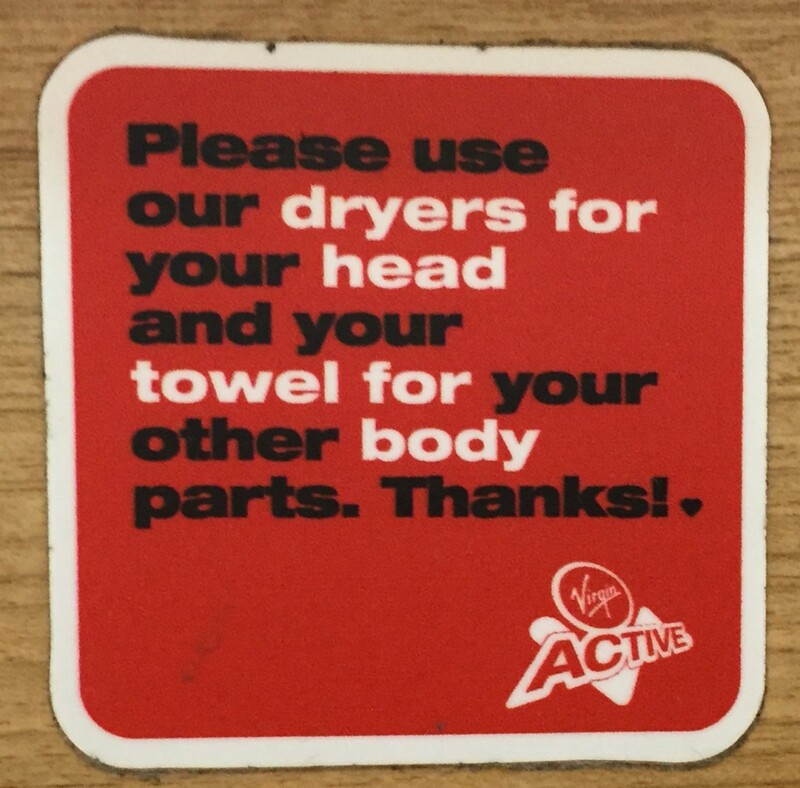 Today at Virgin gym in the city, there was a scrum of blokes in the change room waiting to use the two hairdryers. I’d never really noticed them hanging there before but watched, mesmerised, as the blokes jockeyed in front of the mirror. It’s an interesting thought. Why do you need hairdryers in a men’s change room? Ponder on that. Anyway, these blokes would spend half an hour drying their hair, then rubbing all sorts of goo through it. It was quite a procedure watching the hair dryer preening in front of the mirror. Then, to my astonishment, one bloke grabs a dryer and, with it going full blast, sticks it up under the towel around his waist. And started drying something! What was he drying? I had a vision of scorched gonads! Why would someone do that? This may be an ongoing problem. I noticed the following sign under the mirror. 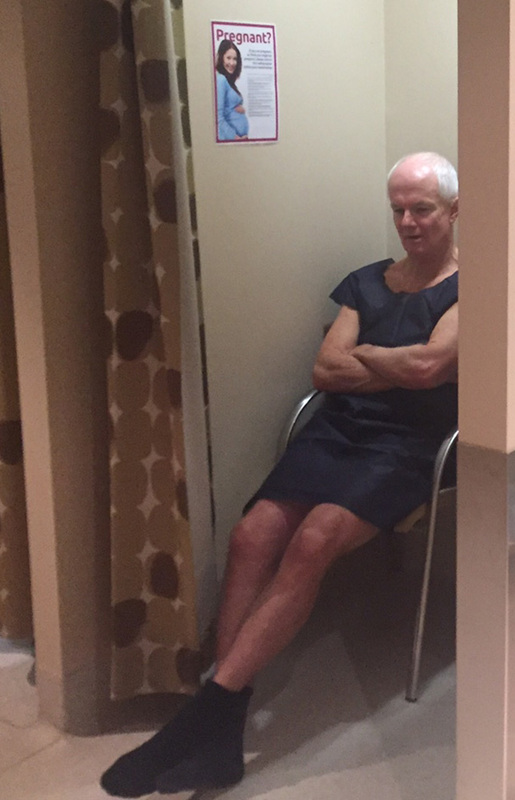 Maybe they have had scorched gonads in the men’s change room before and they want it to stop. Maybe Richard Branson is worried about law suits from crazy, deaf men with singed privates. I’ll ask Marg Carney or Jan Davies about this strange procedure. They are women of the world, so they will understand. It does make me wonder what is happening to Australian males, particularly inner city, professional types. I have never dried my hair with a hair dryer. Ever. Probably never will. A trip to the barber for me these days is a “search and destroy” mission. I worry about our future. If the Japs ever decide to invade Australia again and come pouring down the Kokoda track, I hope none of these inner-city gentlemen will be tasked with defending us. They will stand on Imita Ridge and throw jars of lavender-scented Pomade at the advancing hordes, yelling, “Cop that ya bastards.” Maybe it will work if they yell loud enough, but fair dinkum, not a good look. Very pleased with the session especially as I can now jump off a ledge, albeit a small one, land on both feet and not suffer any ill effects. The exercises are getting more difficult but they are not hurting as much, in fact they are not hurting at all. It’s a red letter day today as my personal training sessions will go from once a week to once a fortnight. I guess this is a sign of the increasing maturity of the rehab program although we both agree I probably still have about nine months to go. I’m virtually halfway throughan 18 month program but the visible signs of improvement from here will be very gradual. I still had to go to the gym twice a week. Kefir – fermented milk. Very good for your insides which tend to be ravaged by Asian bugs and Western food. At last some good news – the gut bugs have departed – gone back to northern India or some other godforsaken part of Asia from whence they came. Good riddance. Don’t come back. Pathology test results came back today and they are all clear. So Dr Tony Wettstein’s weird science works. There may be no clinical trials you can look at and no peer reviewed papers. But trust me it works. So vale Blastocystis hominis and Dientamoeba fragilis. You will not be missed and I will be learning to swim with my mouth shut (if I’m allowed to swim again!). Mr GP Dr Adrian Lim, top bloke, thinks I should either give up swimming or swim with a snorkel. He said it would be very grim if I get Dientamoeba fragilis moving in for some more couch surfing. It may not leave next time and take up residecne in the spare room. I’ve turned the corner, though. All upside from here. And I’ve become a devotee of Probiotics. I had to take Probiotic tablets after the antibiotic treatment as the cure strips everything out of your colon, not just the visitors from Asia. I now have kefir every day. It’s good stuff. Hope it also helps bones to heal. 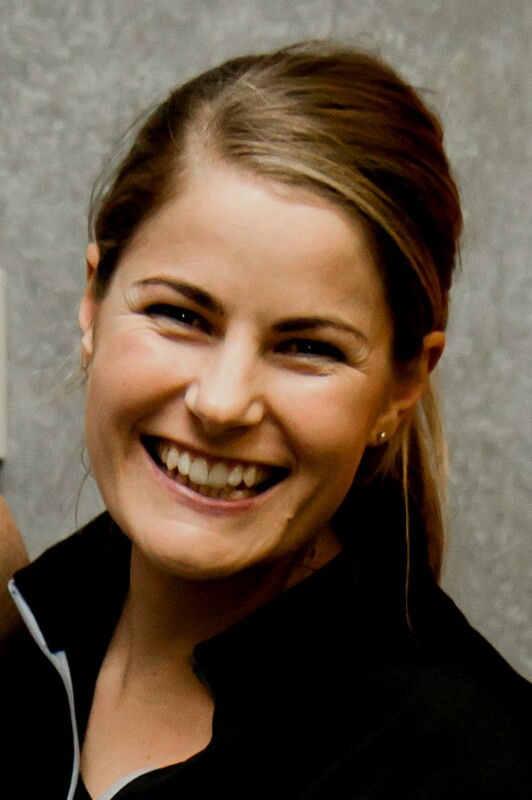 Thank you Alison Maunder, the nutritionist on this site. See tab for Nutrition. I don’t know why gyms have such loud music and it’s awful music anyway. Mindless disco music or endless Rap riffs. It drives me nuts. I asked one of my daughters why they do this and she said it’s supposed to be inspirational. What is inspirational about the Bee Gees doing Stayin’ Alive for the millionth time or some worn out Donna Summer disco music that was idiotic 30 years ago and even more idiotic now. I’m sure that most employees of gyms must end up stone deaf as well as have a musical enema. Richard Branson will, one day, cop a raft of lawsuits from his Virgin gym chain for deafening a whole generation of personal trainers and clients at the gym, as well as ruining for ever the possibility of them appreciating good music. Industrial deafness during rehabilitation is one of the many challenges you may face after a broken leg. I changed and walked out to get on the bike and get the session underway. 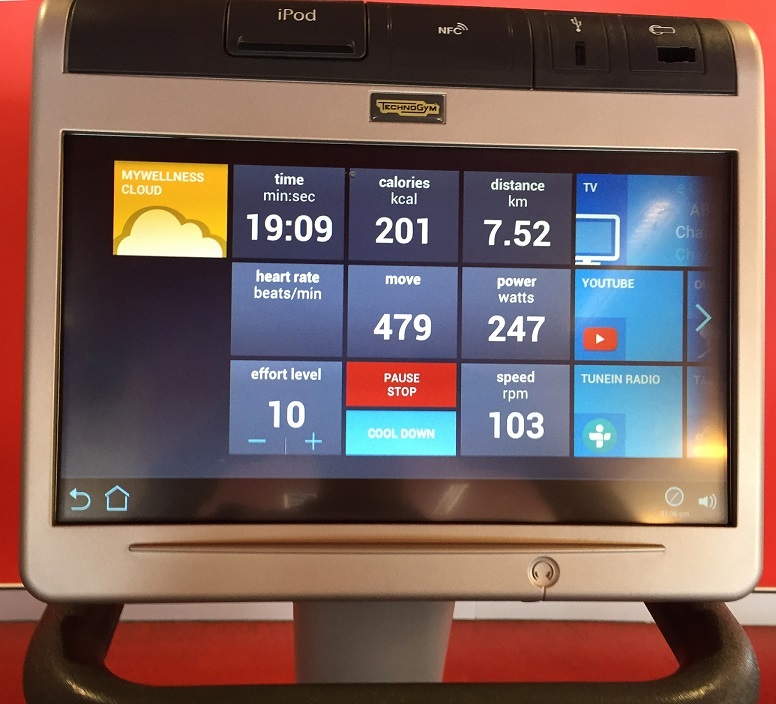 The noise from people running on treadmills, clanking barbells, and banging the weights on the various machines was deafening when mixed with the discordant cacophony of the dreadful music. I couldn’t help thinking of that wonderful scene in Good Morning Vietnam where Robin Williams, playing the music D.J Adrian Cronauer, takes a call from an artillery Sergeant out in the jungle. Cronauer: We’re talking out in the field today. Hi, what’s your name? Caller (shouting): My name’s Bob Fliber! Cronauer: Bob, what do you do? Caller (Shouting) : I’m in artillery! Cronauer: Thank you, Bob. Can we play anything for you? Caller (Shouting really loudly) : Anything! Just play it loud! Okay? On the bike today got up to 100rpm on level 10. Heart rate to 127bpm. Pretty pleased with that. Deaf but sweating like a pig. A pleasant surprise greeted me when I woke up this morning. The first thing I do each morning is lie for a moment and take an inventory of what hurts. 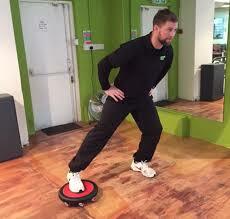 After eight months in rehab I’m stalked by fears of further injury from gym exercises. “I’m gonna feel this tomorrow,” I said to Belinda as I left the gym yesterday. I was particularly worried about the jumping exercise and whether it would hurt my knee or worse, further aggravate my neck problem. To my great relief, my neck while still really sore and with the attendant burning pain in the hand, was no worse than previously. 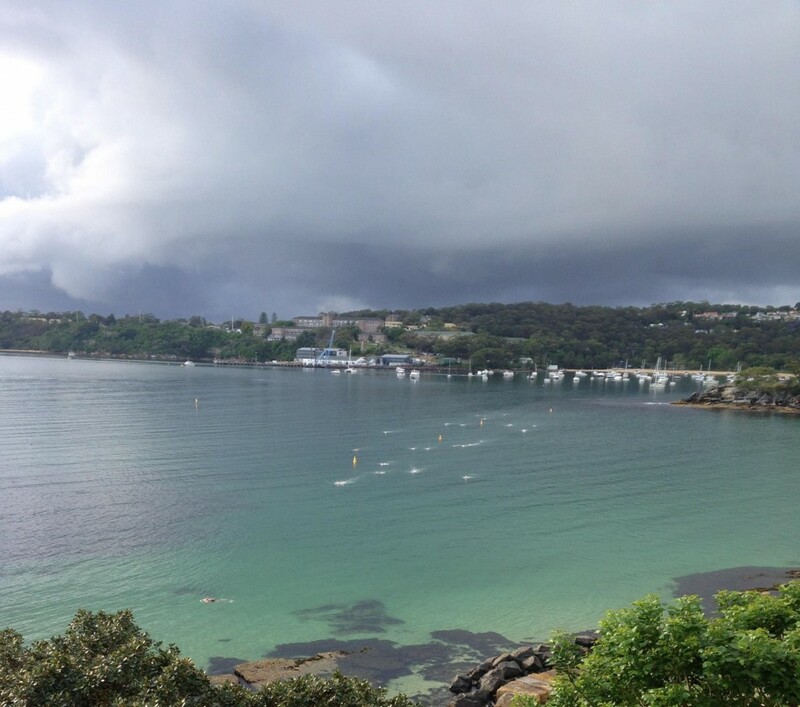 During the day this photo was sent round to all the regular Thursday swimmers at the Balmoral Beach club. It epitomises everything I’m missing at the moment. A joyous, springtime, Thursday- morning, swim in the calm ocean at Balmoral with a group of like-minded souls. I miss the ocean very much. I spend hours sitting on the bench opposite my apartment looking at the water and wishing I could get in it. 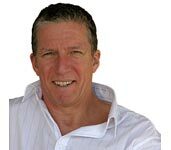 It seems unfair that the plans Barry and I have made to swim from Palm Beach to Manly have now been frustrated twice: once by my broken leg and the second time by simultaneous spinal injuries to both Barry and I. We had better hurry and get better and get this done – we are running out of time. I caught up with Barry today as we were lunch guests of Professor Michael Cousins AO, a pain management specialist and director of the Pain Management Research Institute. The PMRI were to be the recipients of any fund raising we did around our swim. What an inspiring individual is Cousins. He knows so much about the central nervous system and injuries to the spine such as the one I have. I was fortunate to be sitting next to him the whole lunch. His work on spinal-cord electrical implants to ameliorate pain is fascinating. So much I don’t know. I learned that the electrical circuits in our brain and body, which control everything we do, are both AC and DC. I asked him this question as I’ve often wondered. My left hand was burning the entire time I sat talking to him so a pain management lunch was apposite. 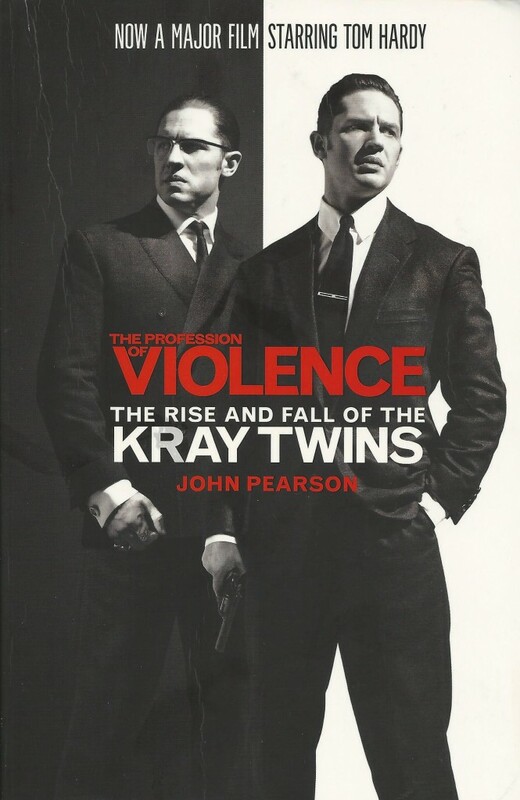 Tonight I finished reading The Profession of Violence about Ronnie and Reg Kray that had been made into a film starring Tom Hardy playing both those notorious twins. The book was disgusting. The only reason I even read it was the Kray name was still resonating when I lived in London in the mid-1970s. This was only about 7 years after their trial and incarceration. Brutal and stupid, they were the ultimate lowlife sweepings from the bar room of humanity. They certainly don’t deserve a book. Why people like me buy books about them or others make movies about them, is a sad comment on all of us. They had not one, single, redeeming feature that I could see, other than stupidity and viciousness. I’ve never considered either of those traits a virtue. Swimming as therapy. I’m missing it.